I chose this quote for today because this is the feast day of Saint Hildegard of Bingen and because of the upcoming People’s Climate March in New York City on Sunday. 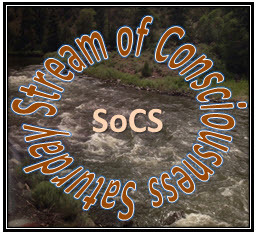 My heart sank when I saw Linda’s prompt for SoCS this week: funny. I have missed the last couple of weeks due to illness and wanted to participate this week, but here is the thing – the last word which anyone would use to describe me is funny. Not haha funny and not even peculiar/funny. I’m much more likely to be described as serious or thoughtful. I don’t joke. I do have a sense of humor, but it is in reacting to others, not any real ability to be amusing myself. Sorry, Linda, but I fail at funny. I’m sure, though, that lots of other SoCS participants will succeed splendidly at being funny and end your week with levity. Cheers to you and to them! Today is my first blogaversary. This is my 164th post, which includes some re-blogs from other bloggers and the occasional re-blog of one of my own posts. I’ve at least proved to myself that I can keep a blog going, resolving what was the biggest doubt in my mind at the start. I have been happy to read and follow other blogs, especially those that, like Top of JC’s Mind, are eclectic in their choice of topics for posts. I am very grateful for Jason Cushman of HarsH ReaLiTy for his generosity via re-posts, meet and greet threads, guest author posts, and blogging advice posts. I also grateful for Linda Hill for her features, One-Liner Wednesdays and Stream of Consciousness Saturdays. I have connected to many blogs that I follow and have gained a good share of the followers that I have through following, reading, commenting, and meeting other bloggers on their blogs. In the coming year, I’m hoping to learn to do more with images with my blog. I want to get some of our Hawai’i pictures uploaded and re-post my travel posts from May with photos. I also hope to continue to refine the look of my blog, either with a new theme or by tweaking the one I am using. I am very slow on the uptake with techie things, although I did finally get an image uploaded so that ,when I comment, there is my picture rather than a graphic. Score one for me! I know it will be good if I can use images on most posts so that the Facebook and WordPress shares are more striking. I just need to learn how to do it without it taking too much time and fiddling and without violating anyone’s copyright. The upshot is I’m much better with words than images! Anyone have any advice/requests/well-wishes they would like to bestow? Just pop down to the comments and let me know! Author Joanne CoreyPosted on September 13, 2014 September 12, 2014 Categories bloggingTags blogaversary, posts, re-blogs2 Comments on First Blogaversary! In commemoration, I am sharing a poem I wrote about the first anniversary of the 9/11 attacks. Three years ago, our home was still without power after the flooding caused by the ten inches of rain from tropical storm Lee, falling on ground already saturated by hurricane Irene a few days before. Standing water from the flooding was two blocks away. Flooded basements were a block away. If we had not had a generator to keep our sump pump going, we would have wound up with at least several inches of water in our basement. It was a record flood of the Susquehanna in our town and the tributary creek behind our house nearly overtopped the flood wall that is designed to direct the water to the undeveloped flood plain on the other bank. There are segments on the local news about the anniversary and saying that the area is almost recovered, glossing over the fact that property buyouts only became available to people in local towns after hurricane Sandy devastated the coast. Demolitions only began in earnest this spring and are still continuing. There will be no recovery for those who left the area permanently after longtime homes were destroyed. Some businesses closed permanently in the aftermath. Only some of the infrastructure repairs hae been completed. One of the more disturbing elements of the situation is that there has been little to no preparation for the next severe flooding event which is sure to come with the increased threat of heavy rain that goes along with global warming. We should be restoring wetlands along the river and its tributaries and re-designing our storm drainage and sewage systems which caused so much trouble in the last two record floods that have occurred in the last ten years. Work also needs to be done with our water system and electrical system to make them more robust in emergencies. Yes, it is expensive to do these things, but more expensive not to do them and to be cleaning up and rebuilding – again – after the next flood. Personal note: I haven’t been posting much lately because I managed to get pretty sick. I’m finally bouncing back and hope to have a few more posts out over the next week. Fingers crossed. This post is part of Linda’s One Liner Wednesday: http://lindaghill.wordpress.com/2014/09/10/one-liner-wednesday-insignificant/. Please, join us!